According to a report in Crain’s Detroit Business, GM scuttled an offer by Fiat Chrysler to purchase the Poletown Plant. GM didn’t have to close down its Poletown Plant. According to Crain’s Detroit Business publication, officials from Fiat Chrysler approached GM to purchase the plant. The time frame when these discussions took place is unclear, but according to the report, GM rebuffed the offer. GM also changed its plan to idle the plant this June by extending the production schedule to next January. And because of that delay, Fiat Chrysler is now building a plant on Detroit’s east side, on Mack Ave.
For Hamtramck, it’s a lost opportunity to have revenue continue coming into the city – although that amount could have gone up or down, depending on what kind of bargain Fiat Chrysler would demand. 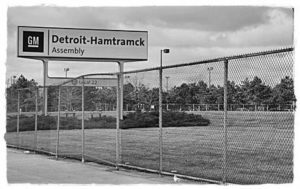 Hamtramck has been receiving about $850,000 per year from plant in lieu of property taxes. That revenue stream is almost certain to dry up when the plant shuts down. That loss of money will be a huge blow to the city’s yearly budget. The expected loss has city officials grappling with how to make ends meet. GM’s response to Fiat Chrysler has Mayor Karen Majewski questioning GM’s motives. “I was disappointed that these talks fell through, and it makes me question what GM’s end game really is,” Majewski told The Review.